The Warner Archive Blu-ray release of the 1948 Blu-ray release of the 1948 noir classic "Key Largo" provides a chance to add it to your collection of perfectly remastered films (including the recently reviewed "Dark Passage") starring Mr., and Mrs. Humphrey Bogart. The magic of Blu-ray allowing custom-made marathon viewings validates that the sexual chemistry between Bogart and Bacall equals that of Affleck and Damon. One difference is that no pop songs celebrate the magic regarding Batt. This John Huston film further is notable for having a particularly strong Orsonian quality is that it has the look and themes of a Welles films. This is on top of the live-stage feel that is attributable to "Largo" being based on a play of the same name. The opening scenes prove that the reputation of Bogart precedes him. 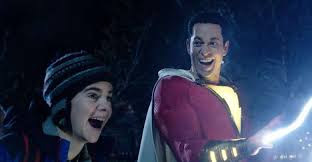 The audience believes that his character Frank McCloud is involved when the local po po stops the bus on which he is traveling to search for less than honest injuns who are fugitives from justice. We quickly learn that McCloud is as clean as a brothel on a Tuesday afternoon. The real fun begins when a hostile motley crew provides McCloud an unfriendly welcome on his arrival at a tourist hotel on the titular Florida island. This shady lot includes drunken floozy Gaye Dawn (Claire Trevor in an Oscar-winning role). Dawn aptly steals the show in a later scene in which mob boss Johnny Rocco (Edward G. Robinson) literally makes her sing for her liquid supper. The reception thaws on the group learning that WWII vet McCloud is there to visit the family of a man who served under him and who died in combat. Bacall plays Nora Temple, who is the widow of the dead soldier. Lionel Barrymore shows much of his broad range in playing the wheelchair-bound father of the man/hotel owner James Temple. The beloved James additionally is the unofficial mayor of Key L:argo. Things escalate to the point of Rocco holding McCloud and the Temples hostage as Rocco, his thugs, and his moll both wait out both the storm and the arrival of a business associate. Huston PERFECTLY stages the confrontations between Rocco and McCloud and/or Temple. These typically include exchanging philosophies. The foul weather ceasing does not coincide with the storm blowing over. McCloud and Rocco still have a score to settle and Nora needs to discover if she can connect with her "Nick" in time. 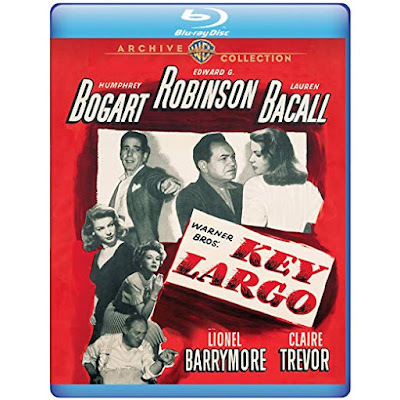 The above discussion of "Largo" provides many reasons why this Blu-ray is worthy of inclusion in your film library. The broader perspective is that the film is a perfect example of how great they used to make them and of they don't make 'em like that anymore.